Always wondered what it would feel like to clip a clay pigeon with a shot on the shooting range? Well, if you're a youth in the area, you'll get your chance – and a lot more. 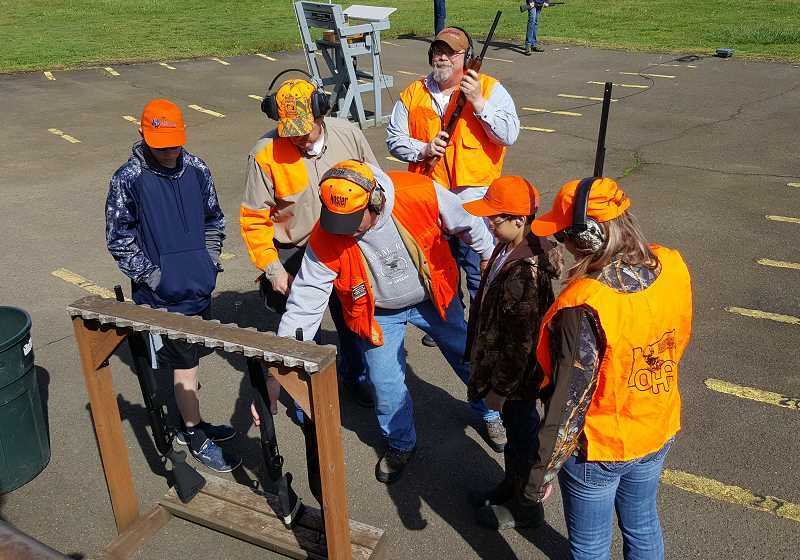 The Oregon Hunter's Association Pioneer Chapter Shotgun and Archery Youth Day will be Saturday, April 27, from 9 a.m. to 2 p.m. at the Canby Rod and Gun Club. The local chapter's event is open to boys and girls ages 8 to 18 and features clay target shooting, beginning archery, 20 and 410 gauge youth shotgun, as well as a raffle, door prizes and lunch. "We have between 75 and 90 kids come every year and I'll tell you, the first time they hit one of those clay pigeons, they're hooked," said longtime member Peggy Johnson. "It's just a really fun time." Located at 25011 S. Molalla Forest Road in Canby, the event offers a shooting range for youths interested in clay target shooting with shotguns. The chapter, which encompasses, Canby, Molalla, Oregon City and Wilsonville, stresses safety at every turn, said Johnson. "Our mainstay is safety," she said. "The kids have to do about a half-hour class before anyone goes out to the range. The ODFW is highly involved in this, too. "Safety is a big deal for us," she added. "Every youth that's out there shooting has an instructor right beside them to instruct them on safety." In addition to a safety class, eye and ear protection is required at all times for shooters – and will be provided along with shotgun and shells. There will also be coaches on hand for one-on-one shooting instruction. A parent or legal guardian must be present. "The kids have the opportunity to shoot trap from 9 a.m. to 2 p.m., we have a break for lunch, and if they want to wander off to do archery, that's available," said Johnson. "For the younger kids, we have stationary targets that they can use the 410 at." Lunch is provided in the $10 youth range fee. BSA shotgun merit badge instruction for Boy Scouts ($15 – includes lunch), and lunch is available for attendees or spectators for $5 per person. "Our goal is that the youth come away with the knowledge that guns aren't all bad," said Johnson. "If you learn safety first, and get them off their computers and phones for a day, they'll have a lot of fun and get to meet other kids." Pre-registration is suggested as there is limited entry on event day.